New analysis of two spear-throwers excavated nearly a century ago in the Ozark Mountains reveals what one archaeologist calls an “uncanny” similarity to those used in the ancient Southwest and Mesoamerica. One of the artifacts — an intact carved wooden spear thrower, or atlatl — was first described in the 1920s, when it was found under a rock outcrop known as the Alred Shelter in northwestern Arkansas. While not identical to those used in the Southwest, each of the Ozark atlatls has distinct features that are “analogous” to two discrete types found in Mexico, New Mexico and the westernmost stretch of Texas known as the Trans-Pecos, according to Devin Pettigrew, a graduate student in archaeology at the University of Arkansas. “The atlatls both appear in the Trans-Pecos, the Ozarks, and central Mexico,” he said in an interview. The Southwestern-style artifacts aren’t outliers, he added. Instead, they’re the latest in a mounting body of evidence — like similarities in basketry, pottery, and rock art — that suggests a long history of cultural influence between the ancient Southwest and the Southeast. “It’s not a new development, but rather the evidence seems to be adding up,” he said. Pettigrew presented his findings at the fall meeting of the Plains Anthropological Society in Loveland, Colorado, and is preparing a paper for publication. Both spear-throwers are estimated to be between 1,000 and 2,500 years old, Pettigrew said, when inhabitants of the Ozarks were transitioning from a hunter-gatherer lifestyle to a more settled one that incorporated agriculture. The Alred atlatl is a simple, 50-centimeter “peeled stick” of a local wood, possibly made from the now-rare Ozark Chinquapin, with a spur at one end carved from an offshoot branch. The spur was used to hold the base of a dart that was launched when the atlatl was flung. But the weapon has a distinguishing feature: a long peg running through a hole drilled near the bottom, forming a T-shaped handle. Atlatls of this style — with a spur whittled from a branch and a so-called “cross-peg” at the bottom — have been found in caves in northeastern Mexico, Pettigrew said, and depictions of them can be seen in rock art in New Mexico and the Trans-Pecos. But this style of atlatl was even more prominent farther south, in the heart of the Aztec culture: Small, charm-like effigies of cross-peg atlatls have been found at excavations in Mexico City, Pettigrew reported, and they even figure conspicuously in ancient battle and ceremonial scenes painted in Aztec codices. Ornamental details varied by region, he noted, but the weapons’ similar structure and design suggest a shared technological tradition. “Most regions probably had their own variation on atlatl styles,” he said. “However, looking through the samples, some ‘parent’ traditions are apparent. “The cross-peg artifacts from the Trans-Pecos and Ozarks, for instance, show slight dissimilarities, [like] in the exact production of the spur. However, they are very alike, suggesting that maybe there wasn’t a big gap between them. Similarly, the Montgomery atlatl offers another view of possible cultural connections between the ancient Ozarks and the Southwest. 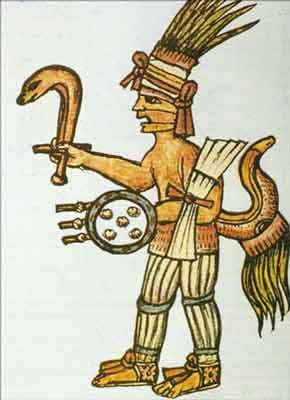 Aztec codices often show the war god Huitzilopochtli holding a cross-peg serpent atlatl. About 33 centimeters long, this fragment is “more intricate and very well made,” Pettigrew said, featuring tapered, carved notches that allowed for a split-finger grip and flared lugs where leather or sinew finger loops may have been attached. The carved indentations, lugs, and overall dimensions are similar to those of throwers found at Puebloan sites in Arizona and the Trans-Pecos, like the 2,000-year-old ritual spot in Texas known as Ceremonial Cave, he said. Until now, the farthest east an atlatl of this type had been found was far western Oklahoma. But as with the cross-peg style, there was great variation among Basketmaker atlatl styles. “Many Basketmaker-type atlatls have their own individual characteristics, and the Montgomery atlatl is no different,” he said. Pettigrew’s next round of research will focus on further identifying the “parent” traditions of atlatl construction, to help trace the evolution of the technology over the millennia and across the continent. For now, he said, the affinities suggested by the two Ozark atlatls may help illustrate just how far some ideas and customs traveled among ancient American cultures. “If you go west from either Roaring River, where Montgomery shelters are located, or White River, where Alred shelter is located, you end up on top of the Springfield Plateau. … Keep going west and the plateau slopes off into the Great Plains,” he said. Gee whiz guys, why is this so far fetched? Travel of ideas and actual items going from one place to another over many thousands of miles has been proven without a doubt. There are trade routes going all over the Americas, from Alaska, to Mesoamerica, to South America and into the Northeastern Americas. Where do you think corn and tobacco came from? And how it ended up in both the deep South (of what is now the US) in the case of tobacco, and into the Northeast for corn? Tobacco originated in the Andes of South America. Corn originated in Mesoamerica (Mexico). The Yaupon holly, Ilex vomitoria that contains caffeine, found in artifacts in the Southwest, came from the deep South (of what is now the US). 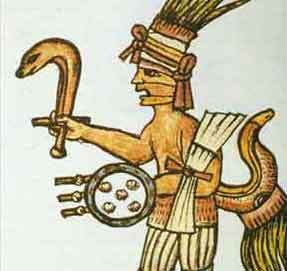 Cacao/chocolate is in artifacts all over the Southwest – Cacao/chocolate coming from Mesoamerica. What exactly is so hard to believe about other items like hunting gear coming from and/or being influenced by other areas? Calm down, Mark. No one said anything about being far-fetched. The pegs used for finger leverage also shares a similarity with the Central Yupik Eskimo atlatl used to throw bird spears band seal darts until the present day on the Bering Sea coast of Alaska.